Madhusudan Singh (SMIEEE) is currently an assistant professor at Endicott College of International Studies, Woosong University, Daejeon, South Korea. He has also serve as research professor at Yonsei Institue of Convergence Technology (YICT) at Yonsei University, Korea (2016, June to 2018 Feb). Before joining YICT, He has worked as Senior Engineer at Research and Development department of Samsung Display, Yongin-Si, South Korea (2012.03 ~ 03.2016). He has received his Ph.D. degree in the Dept. of Ubiquitous IT, from Dongseo University (DSU) (Busan, South Korea) in Feb. 2012. He has completed dual Master's M. Tech. degree in Dept. of IT with the spec. in Software Engineering from Indian Institute of Information Technology-Allahabad(IIIT-A), India in July 2008 and Master of Computer Application (MCA) in the Dept. of Computer Science from Uttar Pradesh (State) Technical University(UPTU), Lucknow, India in 2006. BS degree is the Dept. of Computer Applications from VBS Purvanchal University-Jaunpur, India. Currently, he is Senior Member of IEEE (SMIEEE) and member of ACM, and many more research and scientific organizations. 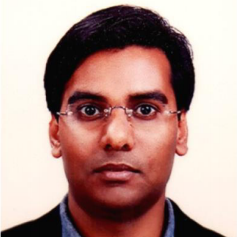 He is also associated as Editor/reviewer/TPC member multiple International journals/conferences. He has published more than 40+ refereed research articles, 9+ national/International Patents, and delivered 15+ technical talks as speakers. His fields of research interests are Blockchain Technology, Cyber Security, Artificial Intelligence, Internet of Things, Software Engineering, and Computer Vision.